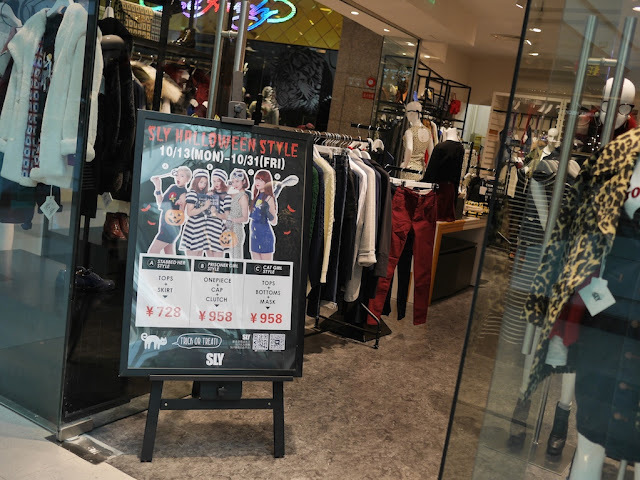 If you are looking to buy a US $150 "prison girl style" costume to celebrate Halloween in Shanghai tonight, the upscale Grand Gateway 66 shopping mall in Shanghai is one place to go. Or you could have ordered a cheaper similar costume online at Taobao for about US $10. 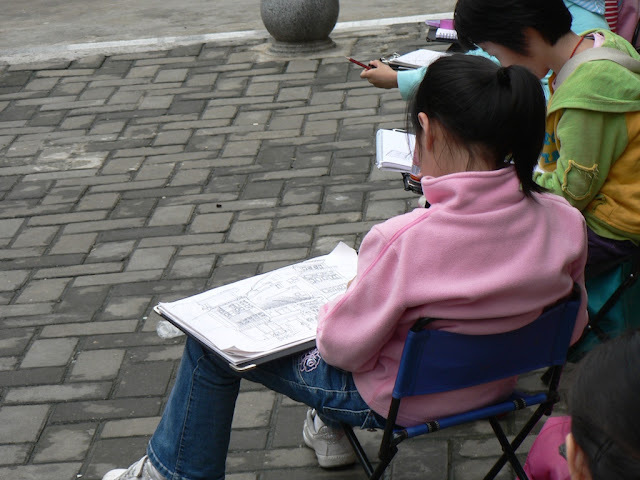 Over 5 years ago in Changsha, Hunan, I saw a group of children sitting on the sidewalk drawing traditional buildings. 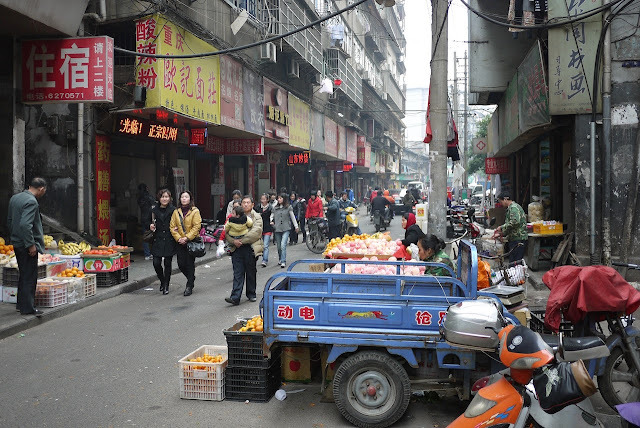 Including a number of demolished neighborhoods and new shopping centers in the nearby area, much has changed in Changsha since I saw those children. 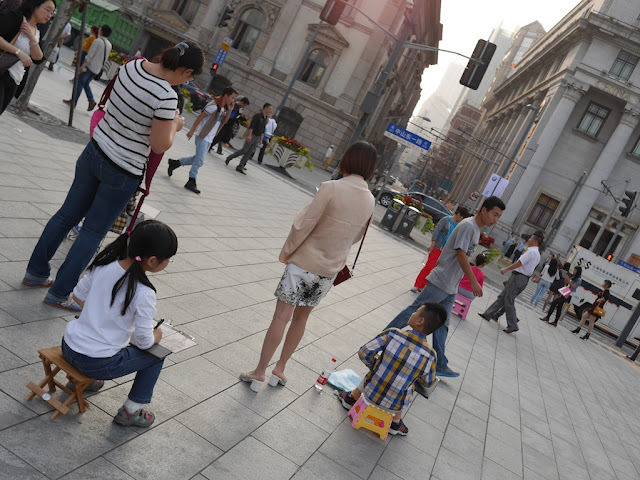 Recently in Shanghai, I saw another group of children similarly drawing the historical buildings at The Bund. And it made me ponder how some things in China's rapidly growing cities change more slowly than others. In one of these buildings today, I enjoyed some rather tasty fish with garlic sauce, and I wasn't even at a restaurant. When I first came to Shanghai almost a decade ago, only the Jin Mao Tower, the shortest of the three, in the middle existed. 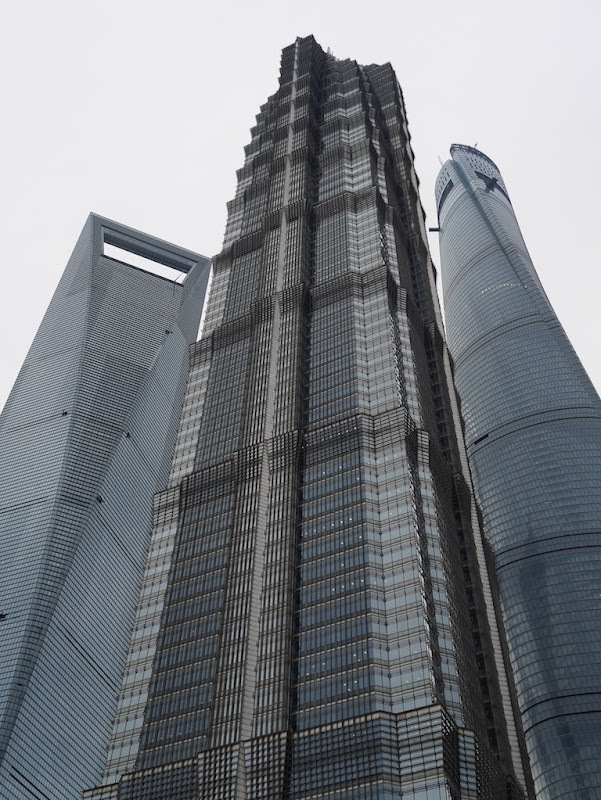 Next year, the Shanghai Tower, the second tallest skyscraper in the world, on the right will be open for all the things one puts inside a 121 story building, including food. I find they present a rather impressive sight. At least equally striking to me, though, is the number of tall buildings continuing to sprout up elsewhere in Shanghai as well. In addition to providing a view of China greatly differing from the usual scenes I share, this is also my way of saying that I am yet again in Shanghai. 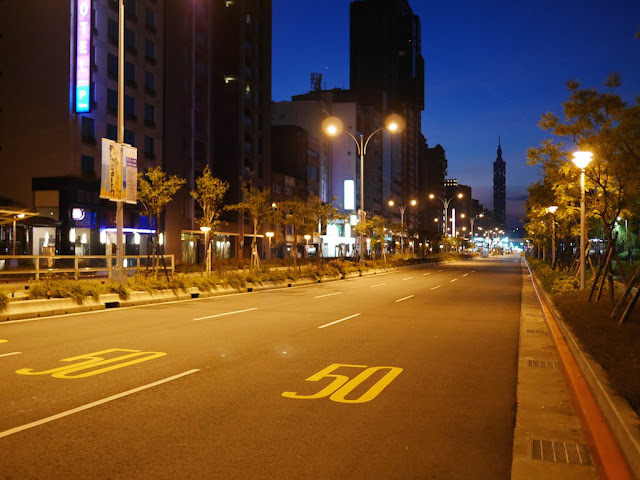 It won't be long until I head to less well-known Chinese lands, but I hope to make the most of my time here by doing a series of brief posts, some of which will tie in what I have found in parts of China with far fewer skyscrapers. 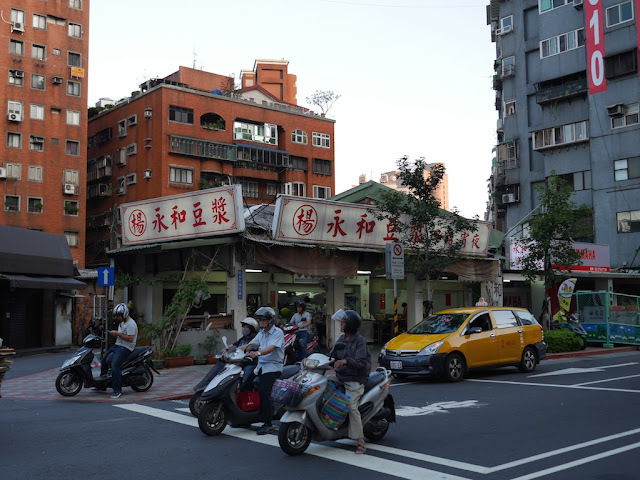 Although more about Taiwan will appear, since I now find myself on the much larger land mass across the Taiwan Strait, the focus here will shift. 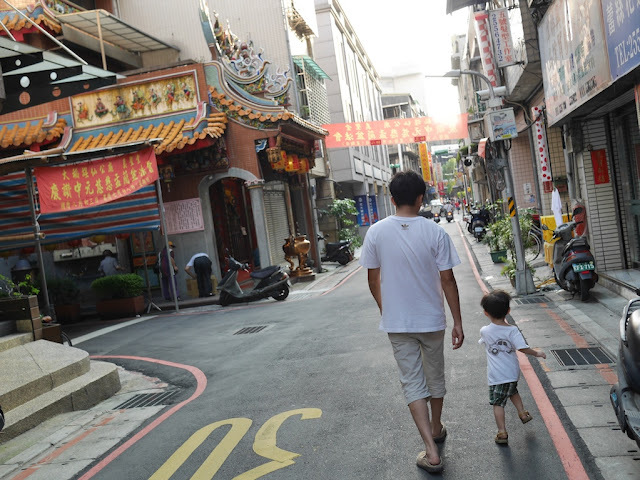 But first, I want to share a few photos which especially resonate with me and show a little more of Taipei's spirit. 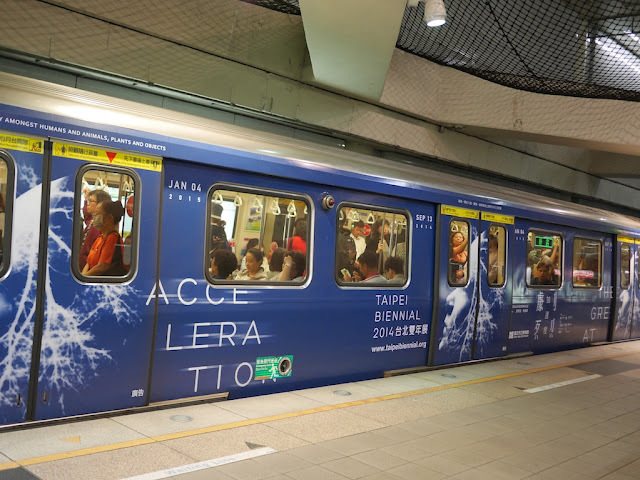 More acceleration in Taipei . . .
Needless to say, I was both surprised and disappointed to learn that the vast majority of the museum was closed in order to install a new exhibition. My visit proved to be rather brief. 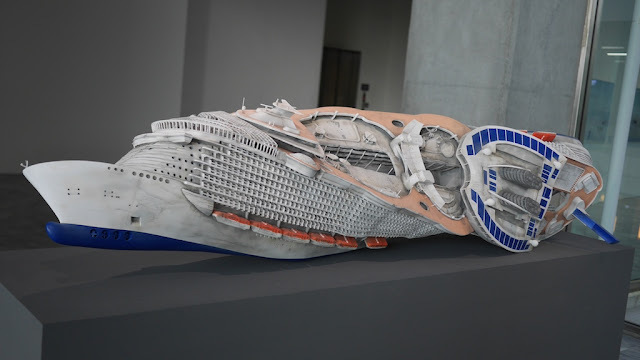 “The Great Acceleration: Art in the Anthropocene,” curated by Nicolas Bourriaud, casts human subjects as both increasingly ghostly, stressing limitations and finitudes, as well more aligned with the organic, strange, and sensory. In other words: both more dead and more alive. These qualities have been thrown into relief by the ascendance of the machinic technologies and algorithmic logics that have come to condition much of our activity and attention. Expanding on these issues, the biennial, held solely at the Taipei Fine Arts Museum, features 52 artists and collectives, finely installed. 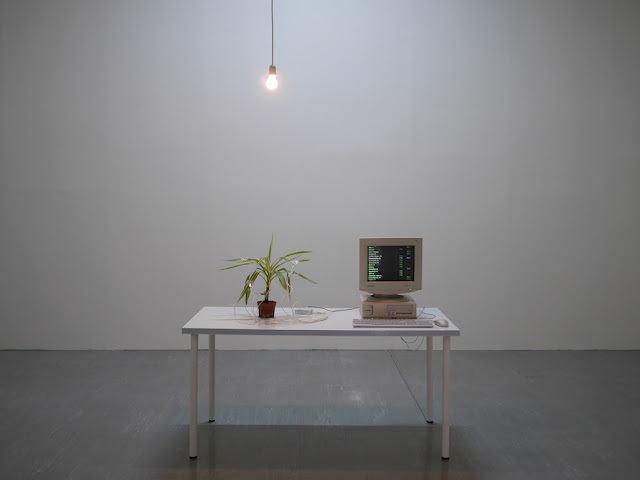 As one might expect from Bourriaud, known for coining terms and corralling practices such as “relational aesthetics,” “postproduction,” and “altermodernism,” artistic approaches, rather than particular geographies, histories, or politics, connected the works in the exhibition. Human activity has been transforming the planet for millennia. All the ecosystems now bear the mark of human presence, but the scale and speed of change in the last 60 years, called by scientists The Great Acceleration, also led them to name anthropocene this new geological epoch — an era marked by the strong impact of human activities upon the atmospherical and geological evolution of planet earth. See the above links for more on the exhibition. 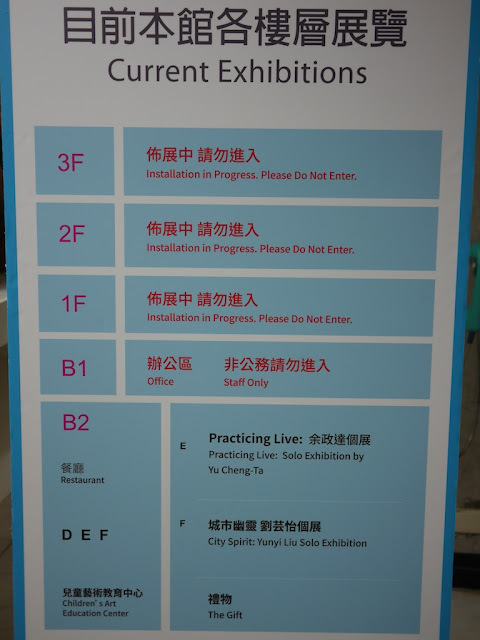 If you are in Taipei before the exhibition ends on January 4, 2015, I highly recommend spending at least an afternoon there. Below I will share photos of just a few of the installations along with excerpts of descriptions provided by the museum. The photos are not intended to be fully representative of the pieces and don't show any of the art videos. But they do provide a hint of the incredible diversity of artistic expression on display. Opavivará! 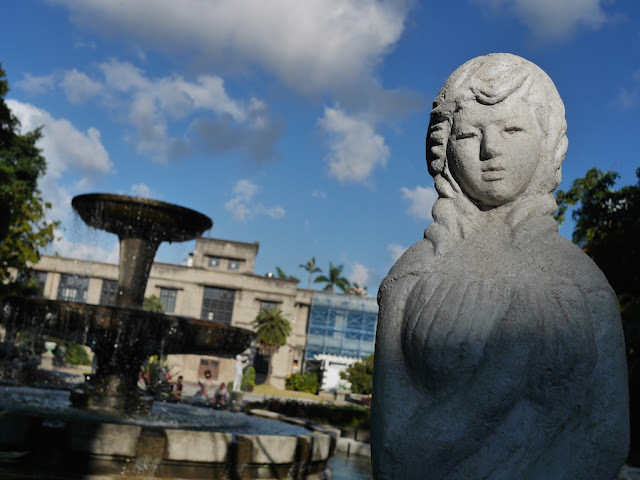 is an art collective from Rio de Janeiro, which develops actions in public places of the city, galleries and cultural institutions, proposing inversions in the use of urban space, through the creation of relational devices that provide collective experiences. 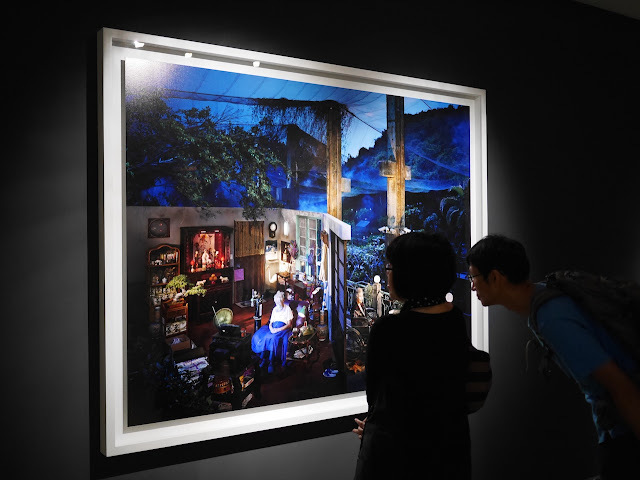 Specially conceived for the Taipei Biennale 2014, Formosa Decelarator is also contaminated by local Brazilian traditions, rituals and tea ceremonies. . . . The idea revolves around a sort of temple of idleness, an invitation to inactivity, a space that worships the non-productive and non-active and that stands as a counter-proposition to our accelerated, superficial and volatile times. 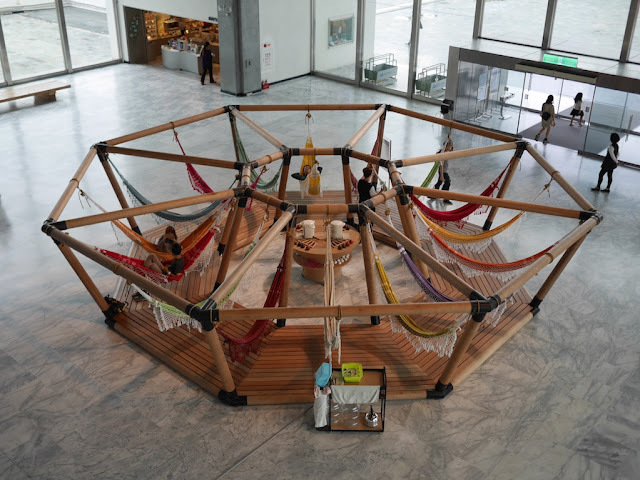 It aims to evoke a collective ambience based on sharing and on the relationships that arise through the interaction of the public, a tool to transform the challenge of living together into a vibrant and pulsating exercise of pleasure, congregation and creative idleness. Every plant is in itself a perfectly economical system, with a minimum of waste, with its own resources, something which certainly can’t be said of many companies. A yucca palm tree has been chosen as a representative of a typical plant for a young urban businessman. The plant has been exposed to six months of intensive market education, during which it has been fed with stock market rates encoded into electric currents, combined with an index-related conditioning diet of either rich or meagre rations of water and sunlight. This is an attempt to stimulate a market-adapted habitus, similar to that which years of financial transactions develop in the experienced stock brokers’ nervous system. Zoo is a space full of imagination and conflict. 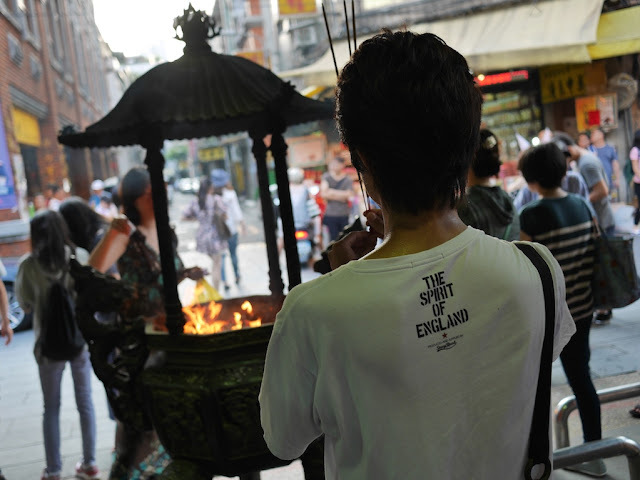 It symbolizes a time of joy (for visitors), yet it also symbolizes a time of confinement and segregation (for animals). It symbolizes the convenience and marvels of modern life (a collection of rare animals from all over the world), and it also suggests a hint of the apocalyptic salvation of Noah’s Ark (protecting species on the verge of extinction). Cages in zoos are used as an allusion to modern people’s lives in cages. 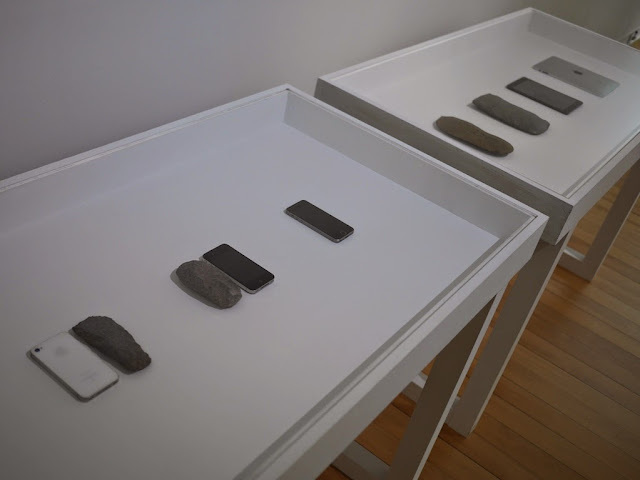 A mobile phone is one of the newest devices of humankind, and a stone tool is the oldest. Actually, they are similar in some aspects. Firstly, the size is similar. When held in a person’s hand, some of them feel very much alike. Stone tools also have “memory” just like mobile phones. You could imagine “calling” or “taking a photo” with a stone tool. Mansaray’s creations particularly focus on unusual yet sophisticated drawings and machines based on his scientific background. 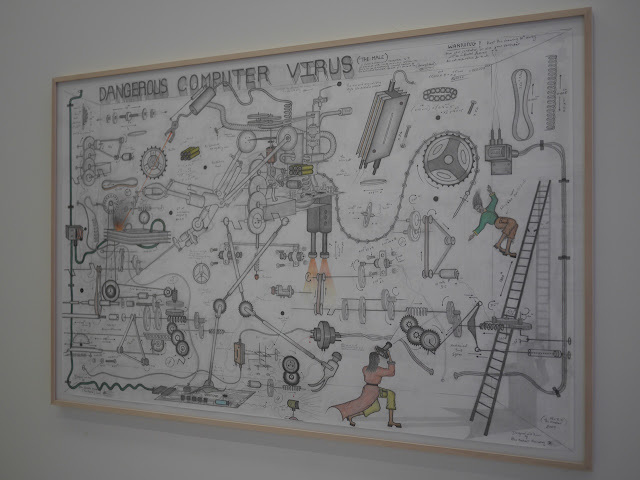 His preparatory drawings, created by pencil, ballpoint pen or crayons, seem to be blueprints, but they can be regarded as the characteristics of his artwork, as evidenced in the works shown at the Taipei Biennial 2014. There is no doubt that the conflicting, warring circumstances of Sierra Leone play an influential role in shaping Mansaray’s creative imagination and futuristic point of view. Even though his works, to some extent, bear witness to the horrors of war, it is still evident that Mansaray attempts to express the power of creation. The term “decriminalization” refers to a situation where a previously illegal activity or action is designated legal. 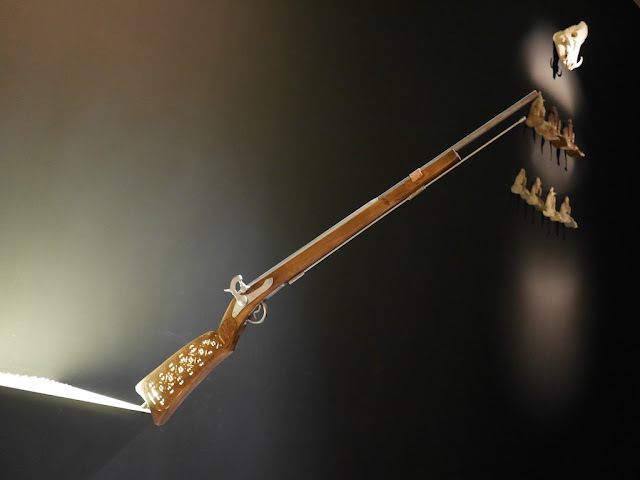 When legal behavior is suddenly reclassified as illegal, that is called “criminalization.” In a civilized society, how is it that the traditional hunting of indigenous peoples results in them being subject to the legal system of a different culture? In the past, hunters were the pride of the tribe, but they are now labeled criminals by the legal system because the prevailing political-economic system declines to respect cultural diversity. The installation Keep Soothe and Carry On, made in 2014, is an installation that takes its starting point in its title, which Douard got from the classic English slogan “Keep Calm and Carry On.” Reflecting present-day reality, this installation is represented in the form of a marketing slogan, with the launch of several derived objects (cups, T-shirts, posters…). 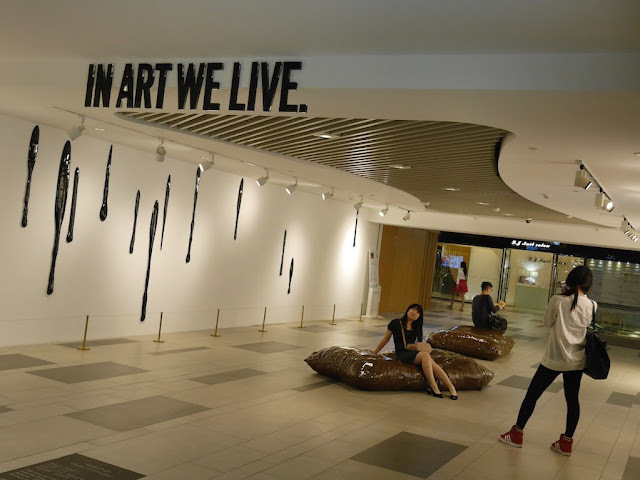 That is why Douard has retained the R of a trademark, serving as a powerful symbol in the installation. Buk is a plastic bucket holding a smart phone that plays “The Ultimate Very Best of Elvis” on a loop. 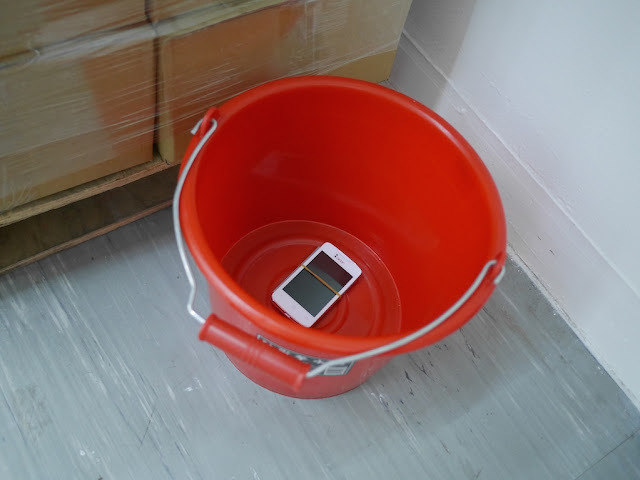 The bucket serves as a soundbox for the smart phone as it amplifies the sound of the music released through the speaker of the phone. This anticipative sculpture witnesses a fictional lifestyle improvement for homeless people in the future. No longer subject to cold, for they will all carry electronic warming systems incorporated into their jackets, the homeless people will reunite and party around Buk rather than metallic trash cans set on fire. 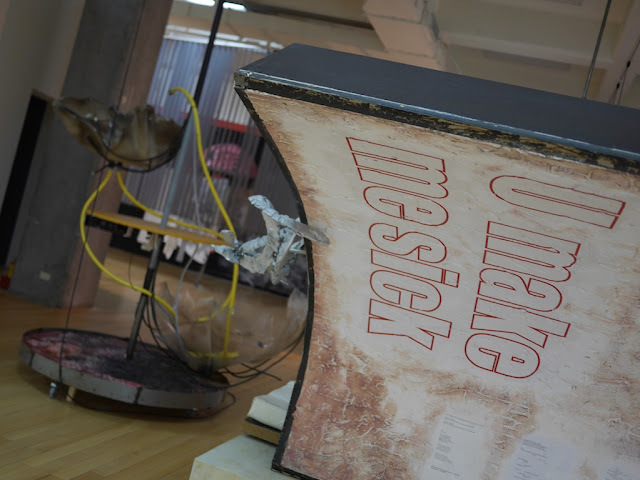 Reflecting ferry disasters, floods and other recent ecological crises, Peng’s work The Deluge – Noah’s Ark attempts to show the impotence of human beings in the face of uncontrollable catastrophic challenges. The rapid acceleration in the Anthropocene era causes climate change, environmental pollution, and ecological crises. All the measures to control these problems seem to be in vain. Human beings are unable to return to the unspoiled living environment of the past, and have become victims of their own endeavors. This work serves as a metaphor exposing the collision between Mother Nature and the accelerated development of industrialized civilization. 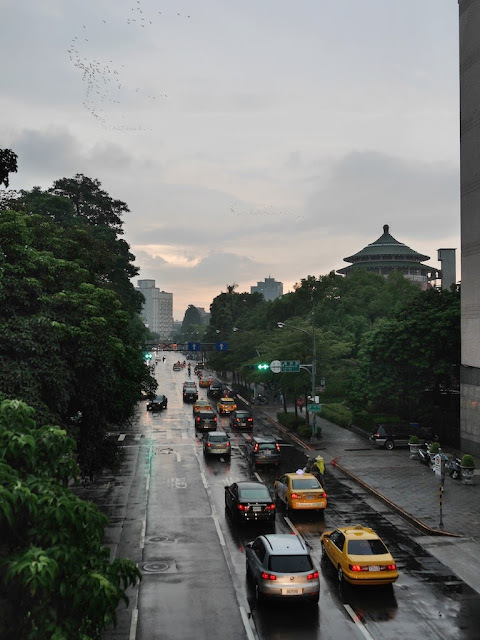 *Correction: an earlier version of this post mistakenly referred to the Taipei Fine Arts Museum as the Taipei Museum for the Fine Arts. 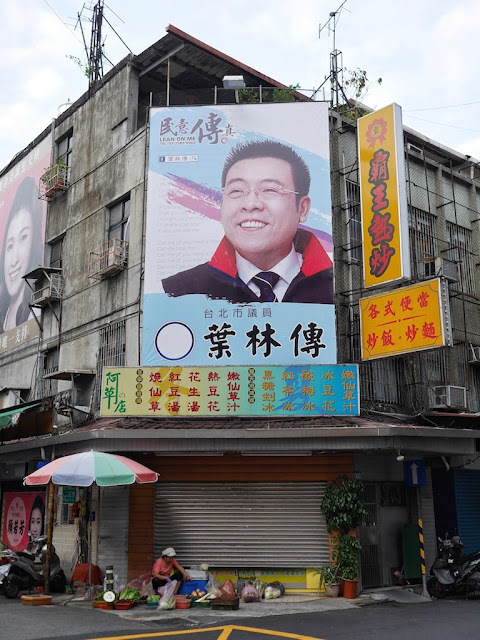 A Taiwanese Politician Wants People to "Lean on Me"
While no other political signs in Taiwan have caught my attention as much as Lin Jinjie's (林金結) Barack Obama signs, one set comes in a clear second for their use of a familiar-to-many phrase. 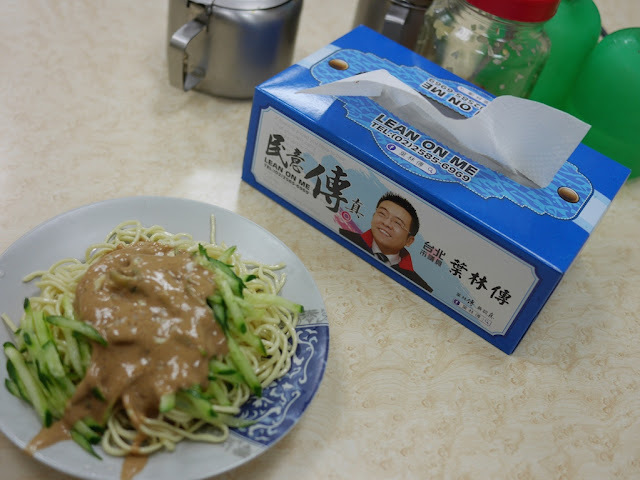 Like Lin Jinjie (林金結), Ye Linchuan (葉林傳) is a member of Taiwan's Kuomintang party and he has his own page on Facebook. 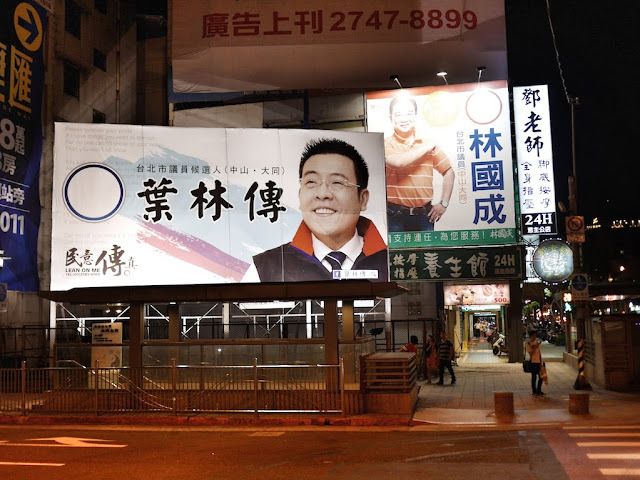 Unlike Lin, Ye is a council member in Taipei City and his signs do not include Barack Obama. Instead, at least some include the title of a song from the 70s by American singer-songwriter Bill Withers. Lest there be any doubt about the source of the phrase, the lyrics to the song "Lean On Me" appear in light lettering on the sign as well. Not only did I see Ye employing this theme on several signs in Taipei, but I also saw it on the tissue boxes at a restaurant where I sometimes eat Taiwanese-style cold sesame noodles for breakfast. As I am not familiar enough with Ye or local Taipei politics, I will refrain from commenting on the effectiveness of Ye's campaign tactics. I will say, though, that the noodles were tasty. 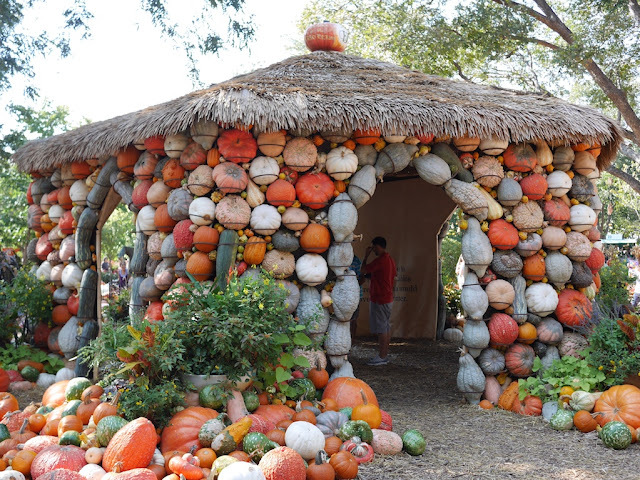 During the last full day of a recent trip covering several regions of the US, I saw pumpkins at the Dallas Arboretum. 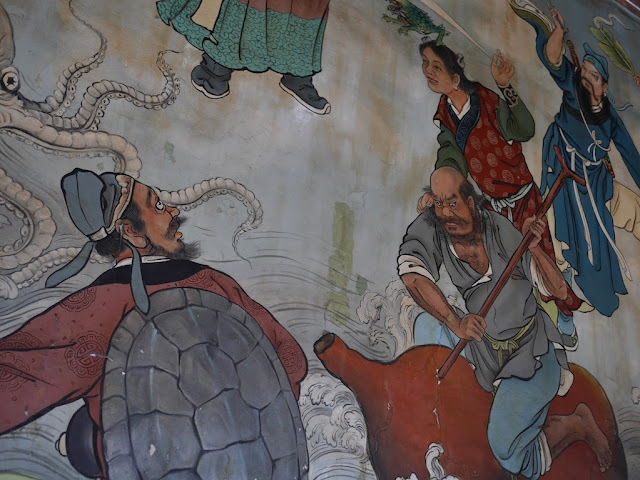 During the first full day after returning to Asia, I saw murals at Taipei's Dalongdong Baoan Temple. 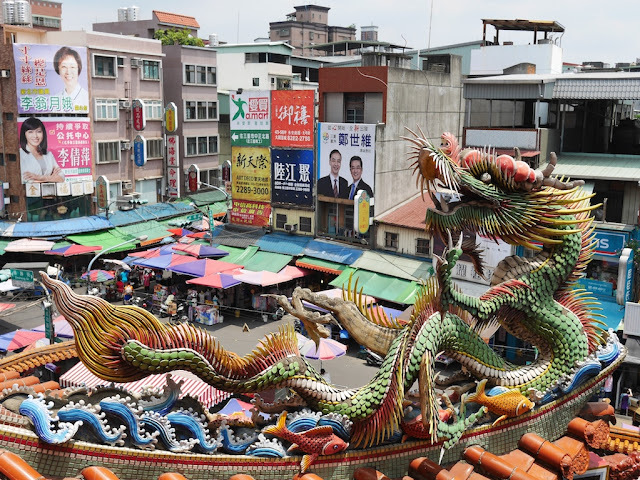 On that note, I am back in Taiwan, although soon I will be headed elsewhere — a place that probably has more religious-themed murals than pumpkin-covered buildings. 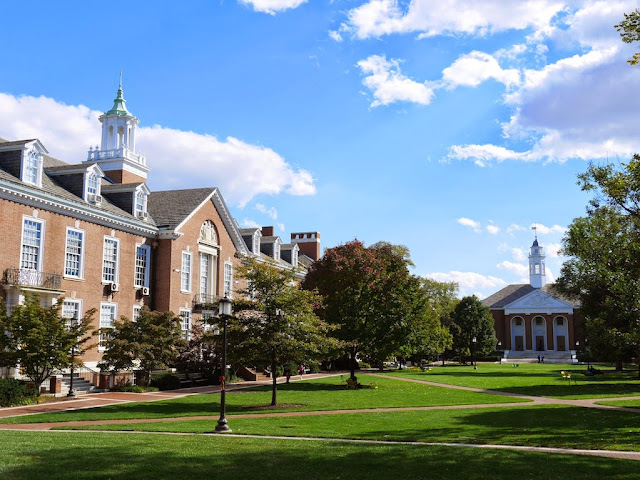 My trip to the US has pulled me away from blogging more than I had expected. I hope to have things back up to speed in the near future. 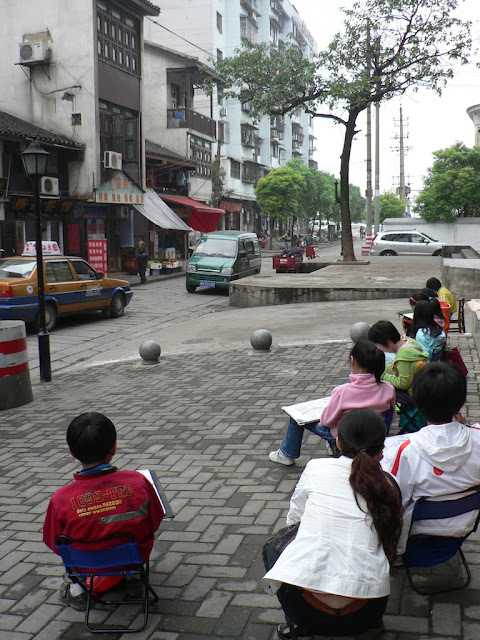 Nanchang, the capital of China's Jiangxi province, was briefly on my mind today, so for now here is an everyday street scene from when I visited the city almost three years ago. Today I was in the latter location and did not have to wear a mask in Beijing due to an "airpocalypse" yet again. 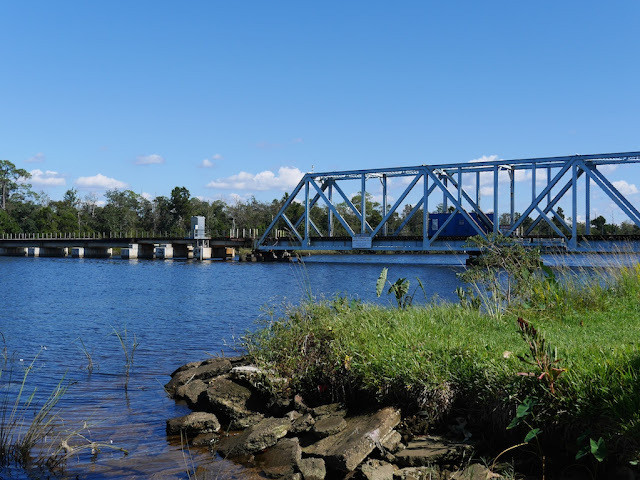 As I travel from region to region in the U.S. during a several-week trip, I have found the relatively clean air — something which once seemed unremarkable — to be so remarkable. And I appreciate it all the more. 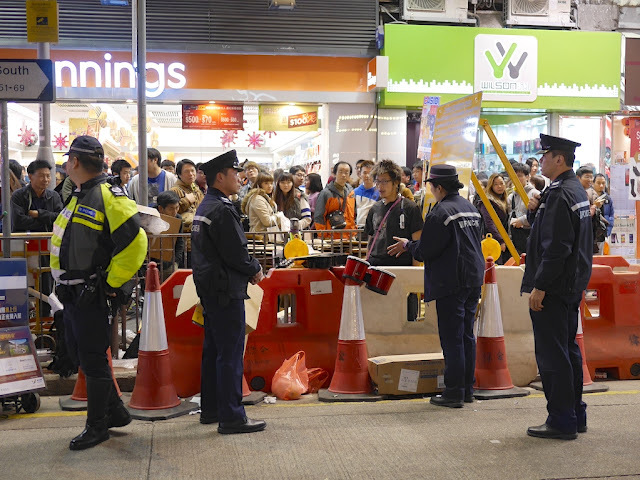 Earlier this year at Sai Yeung Choi Street South in Mong Kok, Hong Kong, I saw police telling a street musician to stop his performance. The musician's initial protests attracted the attention of additional police. Eventually, the musician left peacefully, though not happily. That was about as tense a scene I had ever encountered in Mong Kok. I can't say I expected that later in the year I would be watching far tenser scenes in a video titled "Hong Kong protests: the battle for Mong Kok". 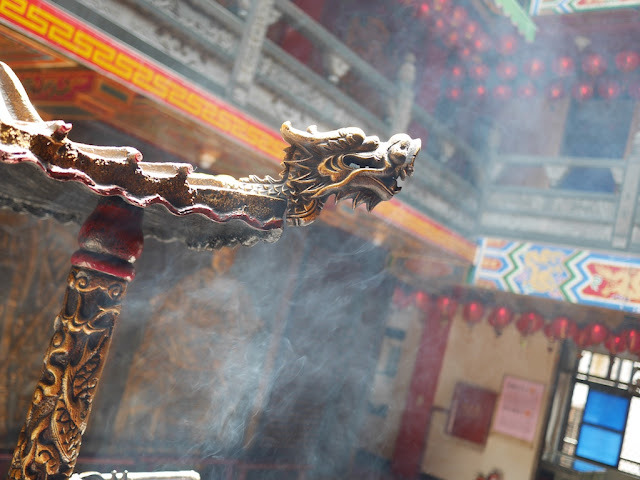 To many in Hong Kong, then, “Chinese” may primarily mean a cultural, ethnic, or racial marker of identity rather than of political nationality. 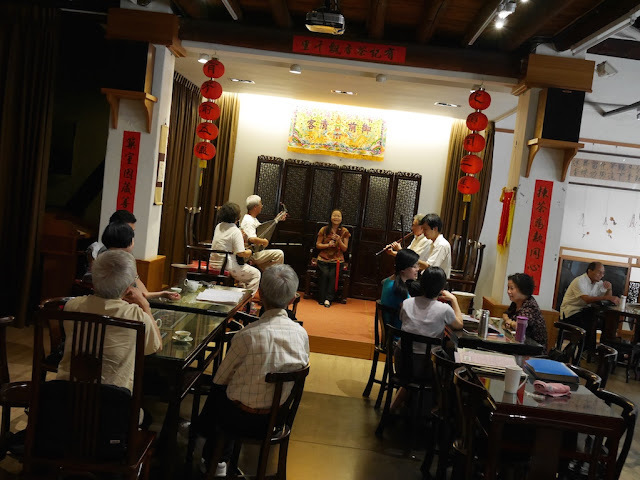 There are “Chinese” of various types who make up the majority population in Taiwan and Singapore, a significant percentage in Malaysia and Thailand, and large numbers around the world. So when the demonstrators chant “Hong Kong People!” they are asserting that to be a citizen of Hong Kong is emphatically not the same as being Chinese. For the authorities in Beijing, this may send shivers down their spines. 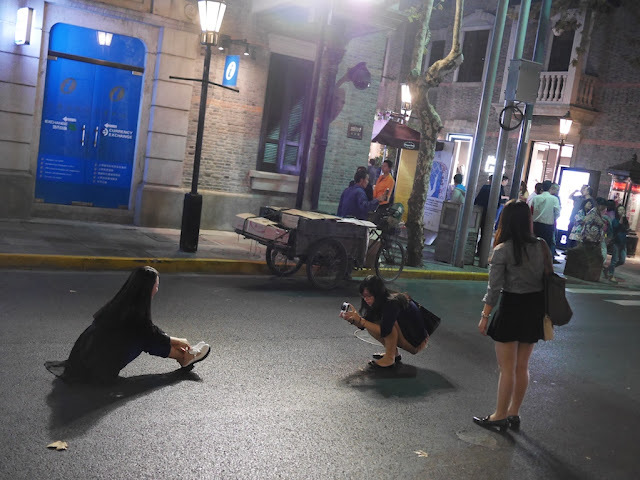 “To tell you the truth, we don’t want to be defined as Chinese people,” said Simon Wong, 24, one of several protesters McClatchy interviewed who made similar statements. “I am not one of those people who thinks that Hong Kong can become independent,” he quickly added. 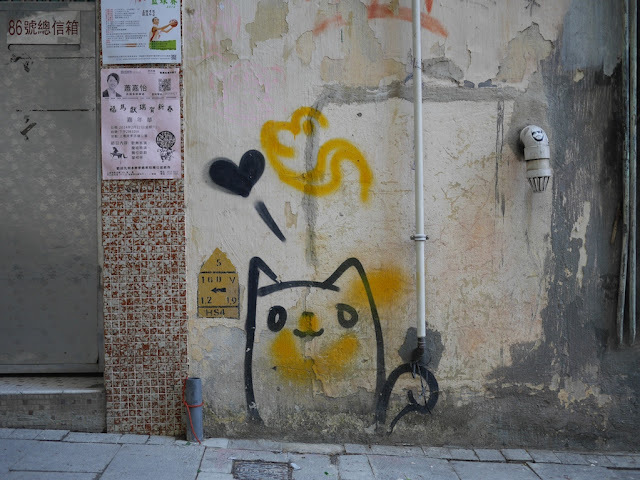 “But Hong Kong is a special place, with a special autonomy. We just want them (Chinese leaders) to keep the promises they have made.” . . .
What would protesters want done if they had real democracy? 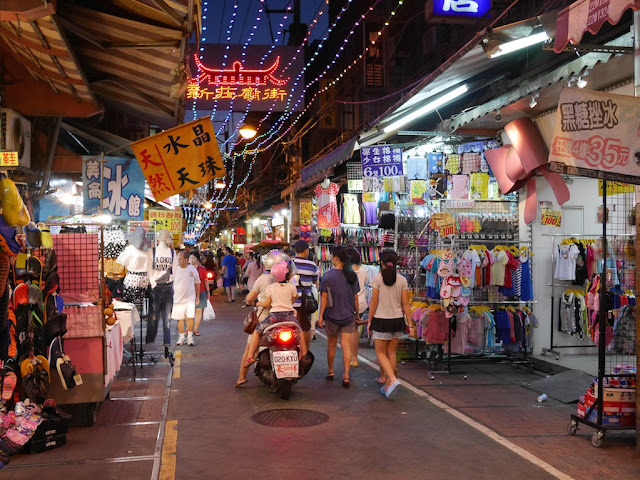 Answers vary, but several young people complained about widening inequality and a Hong Kong economy that caters too much to tourists, many of them from the mainland. They come to shop – or at least window-shop – at the outlets for Cartier, Versace and other luxury brands that line many of Hong Kong’s boulevards. Read both articles for more about how many Hong Kongers identify themselves and what motivates them to protest.